This is quite an interesting paring of guitar players (Jon from Denmark and Don from the USA) and amazing bass (Ken Filiano) and drums (Kresten Osgood). All of these guys are amazing musicians who met up one day in Brooklyn NY for a jam. One day of rehearsal and then this one hour CD was laid down in just 6 hrs.. The CD was mixed in Denmark (LS Studios in Odense). The CD opens with Spirit and it cuts straight into a jam in progress and Dom plays the first solo followed by Jon and then Kresten (yes a drum solo!). It is very nice that in the CD tray they tell you the order of the soloist on each track. Spirit is a pretty fast paced track to begin and very Mahavishnu inspired. Conclusions is next and nearly 10 minutes in length and more laid back and more interactive guitar playing to start as opposed to highlighted soloing and then the intense interactions begin. You can hear in some of the phrasing how this track was originally written to have piano. 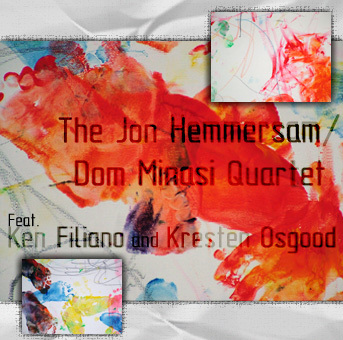 I should mention there are great liner notes from Dom and Jon about each track and how they met and interact, etc.. Inside out is a very laid back piece and Ken takes the first solo on bass and is awesome.. wow… Woman is a ballad originally written by Dom in 1975 and features Jon on nylon string guitar. Beautiful piece. Birth was originally written for a cello quartet and features some intense acoustic playing especially in the middle section. September is another Jon ballad with Dom on 12 string guitar and Jon on acoustic nylon string. Don’t forget to listen to the bass..cool stuff.. Soundcheck is a short and strange like piece, the shortest one on the CD and quite challenging. It was also the real soundcheck of the instruments and headphones! Gentle was written for Dom’s wife and is a slow Bossa Nova piece with brilliant 12 string and acoustic guitars. The playing is very heartfelt. Latina Mia closes the CD and is a Latin inspired track where everyone gets to show off. While I have not mentioned Kresten much, he is also an amazing drummer. You can not go away without being impressed with this CD.. I would also like to mention that it is great news that Dom is recovering from his bout with cancer... All the best in the future Dom.